You’ve probably seen your fair share of diaper cakes which make their debut at almost every baby shower, and consist of layers of rolled diapers topped with colorful ribbon and toys. As an alternative to ‘diaper cake tradition’, check out this adorable and unique “cupcake diaper cake”. The ‘frosting’ is a sweet handcrafted pink cupcake mini blankie from LuLusWoobies. 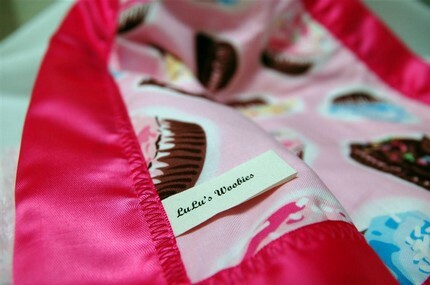 The underside of the blanket consists of a delicious cupcake print, perfect for any sweet little girl. 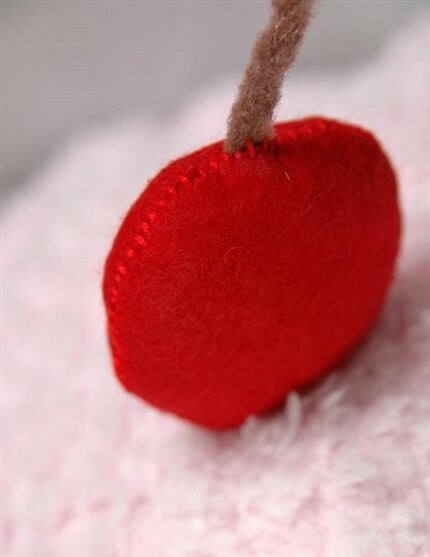 Also, check out the bright red felt cherry on top which can be a fun addition to a play food set in a few years. The cupcake wrapper is hand-folded vanilla cream paper and contains 20 premium diapers, size 1 (8-12 lbs). Very Cool! This boutique-style handmade gift is practical (what new mom couldn’t use a few more diapers) and the cute blanket is sure to be a hit with the baby. Interested? Elements of Entertaining will be carrying these baby shower gifts when we launch, so stay tuned. One of my daily reads is Jenn Sbranti’s Hostess with the Mostess blog. Jenn is an amazingly talented graphic/web designer who has an eye for modern entertaining products and shares her finds on her blog. She recently posted about these adorable cupcake wrappers from Estilo Weddings. Each design comes in either a pack of 12 wrappers for $12 or 50 wrappers for $46. I love the idea of purchasing a few designs and having them in the house for your next party to pull out and jazz up your desserts. Thanks for the great find Jenn! If you haven’t seen the latest craze in at-home spa products for your bath or body, then you’re in a for a sweet treat! Me!Bath, created a yummy line of ice cream bath salts that are shockingly fragrant and beautiful to look at. When submergered in water, each scoop fizzes and melts around your body while creating a hydrating bathtime experince. I love that! Me!Bath also offers Shower Sherbet, Body Icing, Body Wash and some adorable gift sets. There are so many flavors to choose from… my favorite has to be the pink “Gotta Have it Pomegranate” Sherbert and Mini Scoops. Gift these unique bath products at your next party and see how your guests react…the WOWs and thank yous will totally make your day. And how cute would the Shower Sherbert be as baby or bridal shower favors!!! You will also be able to purchase the entire Me!Bath collection through Elements of Entertaining when we launch at the end of April so stay tuned.